Arbroath Abbey is located immediately to the north of the centre of the town of Arbroath, which is itself on the coast 17 miles north east of Dundee. At first sight its urban setting is unexpected: it's easy to forget that much of the town that now fills the space between the harbour and the abbey has developed since the abbey was first built, some eight centuries ago. For the modern visitor Arbroath Abbey can readily be missed, despite plenty of brown tourist signs. It should certainly not be overlooked. What you find when you seek it out is one of the most extensive and most interesting abbey ruins in Scotland, with plenty to see and do, plus an excellent visitor centre. The story behind Arbroath Abbey began in July 1174. Henry II of England, fighting off incursions by the French in Normandy and the Scots in Northumberland, undertook a pilgrimage to Canterbury Cathedral and spent a night praying at the shrine of Thomas Becket, whose murder he had prompted four years earlier. It later emerged that at the precise time Henry left Canterbury Cathedral, King William I of Scotland was captured by English forces at the second Battle of Alnwick (see our Historical Timeline). He was only released later in the year after signing the Treaty of Falaise, which acknowledged Henry II to be William's feudal superior. Both men read great significance into the timing of William's capture, and the main lesson that King William I took away was that he needed to work much harder to ensure God was on his side in future. With that in mind, in 1178 he founded a monastery at Arbroath for a group of Tironesian monks previously resident at Kelso Abbey. He also bestowed considerable lands and great wealth on the Abbey, including the nearby St Vigeans Church, which in some ways it displaced. As a final mark of the importance he attached to Arbroath Abbey, he granted it custody of the Monymusk Reliquary, a casket believed to contain the relics of St Columba and now on show in the National Museum of Scotland. On William's death on 4 December 1214, his son Alexander II helped carry his body to its place of burial in front of the high altar in the still only partially completed Abbey Church. This was finally consecrated in 1233, and there are hints it many not have been completed even by then. The church that emerged was so large and splendid that few major structural changes were needed over the following centuries of its active life. The main exception to this followed storm damage in 1272 to the north west tower. During repairs it seems that the tower was heightened. At a more human level, the daily round of services, taking place from 1.30am to 8.30pm, set the routine for abbey life. Meanwhile, Abbots came and went. One, Robert, the 8th abbot, was expelled by his monks in 1267 for unspecified misdeeds. Another, Henry, the 13th abbot, was the subject of (unsuccessful) complaints by his monks to Pope Nicholas IV. 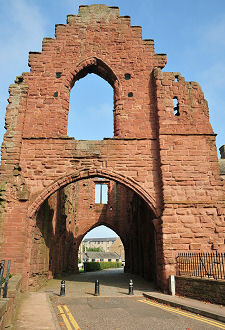 Perhaps the high point in the history of Arbroath Abbey occurred in April 1320. Bernard, Abbot of Arbroath, who was also Chancellor of Scotland under Robert the Bruce, oversaw the drafting of the "Declaration of Arbroath", thought by many to be the most important and influential document in Scottish history. This was a letter written to Pope John XXII on behalf of Robert, and signed by most of the great and good of early 14th Century Scotland. It asked the Pope to put pressure on Edward II of England to recognise Robert as the legitimate King of Scotland; and it also asked him to remove the excommunication that had been placed on Robert after he had murdered the Red Comyn in a Dumfries church in 1306. The Declaration is famous for one phrase in particular: "For, as long as but a hundred of us remain alive, never will we on any conditions be brought under English rule. It is in truth not for glory, nor riches, nor honours that we are fighting, but for freedom  for that alone, which no honest man gives up but with life itself." Much more historically significant was the implication elsewhere in the declaration that in future the King of Scotland could only rule with the approval of the people of Scotland. It was the first time anyone, anywhere, had thought about royalty in this way. The Declaration of Arbroath, and the (since lost) parallel letters to the Pope from Robert the Bruce and the Scottish Bishops did gain the lifting of Robert's excommunication. It also led to Papal intervention that brought about the Treaty of Edinburgh & Northampton of 1 March 1328, under which the English King Edward III recognised the Kingdom of Scotland as a fully independent nation in return for £20,000 Sterling. The peace only lasted five years, but the Declaration of Arbroath is seen by many as having a much more lasting impact, influencing the US Declaration of Independence. Arbroath Abbey's later history never quite recaptured the glory of 1320. Its role increasingly became one of simply sustaining itself and the fabric of its buildings, and protecting the rights given to it. This was made no easier by an English attack from the sea in 1350 that badly damaged the abbey. And in 1380 there was a great fire, the effects of which took over 20 years to repair. If 1320 was the Abbey's high point, its low point came on 24 January 1446. By this time the Abbot usually delegated most of his non-religious functions, powers and privileges to a nominated "Bailie of the Regality". This was a hugely lucrative and highly sought-after position that tended to reside with the Ogilvy family. At the beginning of 1446 the Abbot appointed James Ogilvy to the role. A rival, Alexander Lindsay, arrived in Arbroath with a large crowd of supporters to challenge the appointment. The result was the "Battle of Arbroath", fought in front of the Abbey and through the streets of the town. As many as 600 people are said to have been killed. The wealth and power of Arbroath Abbey had other undesirable consequences over the following years. 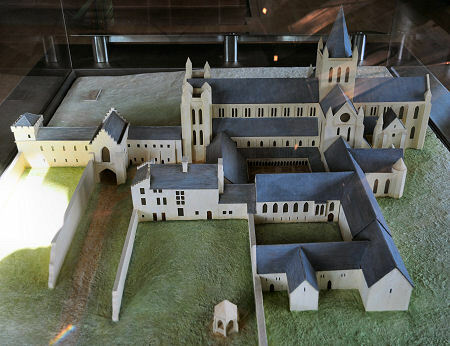 By the early 1500s control over the abbey had become a commodity to be traded between the powerful of the land, and it was no longer the norm for the abbot to live here. In 1524 Cardinal David Beaton, acting as abbot, granted part of the Abbey lands to his mistress, Marion Ogilvy. The Reformation of 1560 had a less dramatic effect in Arbroath than elsewhere. Three of the 22 monks then living here became ministers in the Reformed church, while most of the rest lived out their days at the abbey. By 1580 the abbey was being used as a quarry for building stone. 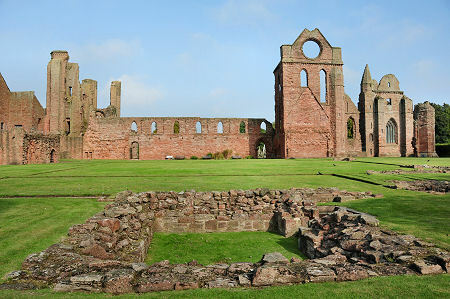 In 1606 the Parliament granted the abbey estates to James, Marquis of Hamilton who, as the last Abbot of Arbroath, had converted to Protestantism. Only ruins remained when James Boswell and Dr Johnson visited in 1773, though conservation work then began as early as 1815. You can read Dr Johnson's account of their visit to "the monastery of Aberbrothick" here. Visitors today will find the ruins of much of the Abbey Church are rather better kept than Dr Johnson, who recounts "following the walls among the grass and weeds". Parts of the Abbey such as the Abbot's House found alternative uses after the demise of the Abbey and as a result remain in excellent condition. The overwhelming sense is of an oasis in the heart of Arbroath, in which the red of the stone contrasts perfectly with the green of the mown grass. And today's visitor is also greeted by an outstanding visitor centre. This contains a range of interpretative displays within its wave-shaped form, and also carries a viewing gallery from which much of the abbey can be seen. But what is most striking is its design. This is obviously modern, yet with its red stone and glass structure topped off with a remarkable moss and grass covered roof, it truly is a worthy addition to a site that has inspired wonder for over 800 years. Once you are through the visitor centre you emerge in the west end of the abbey church. This must have been a simply staggering space to all who saw it when first built. The south walls rise to considerable height, but those on the north side are largely absent, giving rise to a "cut away" impression that brings the neighbouring graveyard right to the edge of the building. As you enter the abbey itself, it is worth taking a mental note of the location of the door back into the visitor centre, as it not obvious when the time comes to leave. There is a great deal to see at Arbroath Abbey. The standing ruins themselves are large and extend to the west, beyond the west doorway and visitor centre to the gatehouse and Regality Tower. The best place to appreciate the sheer scale of what once stood here is from the now open area to the south in which wall lines and slight remains mark the location of the cloister and the little cloister. Within the abbey church itself visitors can explore the sacristy, or climb to a viewpoint high on the south transept wall. There are more opportunities to exercise your vertigo by climbing to another viewpoint above the west doorway: via a route that also gives access to the upper floor of the gatehouse. The lower floor of the gatehouse is accessed from the south, and when we visited was home to an exhibition tracing the links between the Declaration of Arbroath and the US Declaration of Independence. Perhaps the biggest surprise of a visit to Arbroath Abbey is the superbly preserved Abbot's House. A door in the east end of the ground floor level gives access to a series of vaulted spaces. Make sure you don't overlook another door around on the north side of the building which gives access to the upper two floors of the Abbot's House. The highlight of this for us was a display of magnificently carved stones which together offer just the slightest of hints to the sheer magnificence that would have been on display throughout the abbey during its heyday.